It's a myth that Portland, Oregon is too cloudy for solar power-it is now home to the largest PV system in the Pacific Northwest, a system that is using state-of-the-art solar panels that feature a proprietary solar cell interconnection to increase power generation. John Murphy wants to dispel the myth that Portland, Oregon is too cloudy for solar power generation, and he's doing it in a big way. "We really only get 36 inches of rain, and most of it comes in the winter," says Murphy, president of the Pacific Habilitation Center Northwest (PHC) in Portland. "We're still a little bit over a 1:1 performance ratio. When you get down to Southern California, it's a 1.3 to 1.4:1 ratio, so we're definitely lower, but we are still very much in the ballpark. If it was lower than 1:1, it would harm our economics." Murphy was one of the driving forces behind PHC's 870-kilowatt, roof-mounted photovoltaic system that will be fully online by the end of this year. 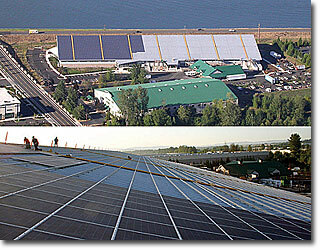 When completed, it will be the largest PV system in Oregon, not to mention the entire Pacific Northwest. It also will use state-of-the-art solar panels from Day4 Energy that feature a proprietary solar cell interconnection method to increase photovoltaic power generation. Along the way, not only did Murphy buck perceptions about how successful solar power could be in the Pacific Northwest-he also pushed to have four Oregon state laws and Public Utilities Commission rules that address solar energy generation changed. Portland-based Dynalectric Company Oregon, a subsidiary of EMCOR Group, Inc., installed the 4,830 Day4 Energy panels with a hybrid racking system that uses S-clamps that attach to the lip of the sheet metal roof. The mounts have to be able to withstand winds of more than 120 mph that occasionally come out of the Columbia River Gorge. Murphy says he hopes the benefits of their particular project go far beyond just the savings that PHC will enjoy on utility bills. "We think this has the potential to put us on the map and to let people know who we are and what we are about in a way we couldn't afford to do," he says. "If we can do this, it seems to me that it's certainly in the realm of possibility that 400 other businesses here could do it and that would basically eliminate a coal-fired power plant. We're demonstrating a model that people can really use." Murphy began considering solar energy for the new building more than 30 months ago when he read a couple of articles in Scientific American magazine. "They were really comparing the carbon cycle and renewable energy and what's really renewable," Murphy says. "The conclusion they came to is solar is kind of like a home run. But when you get to solar, there's only one hurdle and that's financial." At the same time, the non-profit organization, which trains and employs people with disabilities, was beginning plans for an 110,000-square-foot building that would house its expanding light manufacturing facility. With Murphy's admitted aversion to anything that might leak, such as skylights, the building features a clean pitched corrugated metal roof. Just by accident, the building was to face slightly west of south next to the Columbia River, with clear exposure to the sun. "We had this huge blank roof, so it's kind of like, 'Well duh,'" he says. Murphy originally had a one-megawatt system in mind, which would be about 150 percent of the facility's current usage and would allow for future growth. "When you do a roof-mount system, though, you are limited on your pallet," he says. With that in mind, Doug Boleyn, president of Cascade Solar Consulting LLC of Gladstone, Oregon recommended the 48MC panels from Day4 Energy Inc., a British Columbia, Canada-based firm, because of their high energy density. 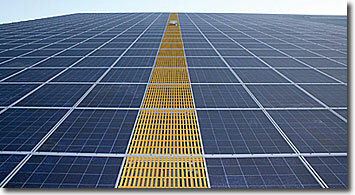 Since 1965, most solar cells have been made of silicon covered with fine silver lines that capture electrons. These lines feed the electrons into silver bus bars that also serve as soldering points to connect the solar cells together in series, making a photovoltaic module possible. But the technology has a number of drawbacks that may reduce performance, says Dan Murray, Day4 Energy sales manager. The largest is that series resistance builds up due to soldering, downgrading performance. "People have been working on this problem for decades, trying to connect cells without degrading performance," Murray says. Day4 uses a method that replaces the bus bars with Day4 electrodes consisting of rows of alloy metal-coated copper wires. The wires run on top of and perpendicular to the silver lines, connecting them to neighboring cells at about 36 points. The result is 20 times more points on every cell conveying electrons, Murray says. "It's kind of like fishing with a net vs. fishing with a line," he says. "You just catch more electrons." The Day4 48MC panels, under standard test conditions, will capture 1,000 watts per square meter at 25 degrees Celsius, producing 14.7 percent efficiency, which is about five percent more than standard polycrystalline PV panels. "What we have done is taken the basic technology and enhanced its ability to collect electrons from the silicon, so we have a higher power density," Murray says. "You get more power per square inch from the multi-crystalline cell, which means less modules for the space you might have." In place of the soldering, which can reach temperatures of over 350 degrees Celsius, Day4 connects the cells during lamination, and temperatures only reach 180 degrees Celsius. "So the cells are not shocked with high temperatures," he explains. The new connection method also creates a longer-lived module, Murray says. Northbrook, Illinois-based Underwriters Laboratories Inc. (UL) conducts laboratory tests that simulate wear and tear over 20 years. Murray says Day4 conducted tests at UL that simulate what the panels might encounter over 140 years, and the company saw less than 3.5 percent degradation. Without the silver bus lines, the panels also take on a different appearance. "A lot of people come to visit and they say, 'Where are the panels?'" Murphy says. "You don't see the wide foil strips, so on a sunny day they are the color of the sky and on a cloudy day they are gray. They just blend in." Murray says they were fortunate that PHC decided to go with the solar panels in the early stages of the project. That way, the architect-Ernest Munch of Portland-could incorporate the panels into the building's design. The manufactured Butler building that now houses PHC was built with the roof rafters lining up exactly below the solar panels for even weight distribution. Portland-based Dynalectric Company Oregon, a subsidiary of EMCOR Group, Inc., installed the 4,830 panels with a hybrid racking system that uses S-clamps that attach to the lip of the sheet metal roof. The mounts also had to withstand winds of more than 120 mph that occasionally come out of the Columbia River Gorge. "Munch literally designed the building around it," Murphy says. "The metal rafters are spaced so you have direct forces from the racking system down through the roof without penetration." Seven 125 kVA inverters from SMA America change the DC current into AC. Scientific American identified-financing the $6.45 million system. "Energy rates are low-we normally pay seven cents per kilowatt hour. That's why when we looked at it initially, it just didn't work," Murphy says. "We had to change four laws and change the philosophy of the Public Utilities Commission." Until PHC approached the PUC, the group had basically dealt with homeowners with systems of less than 25 kW, retail and farms. "But we have a manufacturing facility with a power plant on the roof, and people weren't thinking in those terms," Murphy says. Probably the biggest change that occurred was when the Oregon Legislature slightly more than a year ago passed a property tax credit of 50 percent on solar installations, a credit which is taken over five years. Before the legislation, the tax credit was only given to systems of 25 kW or less. Now systems up to 2 MW qualify for the credits. Being a non-profit organization meant PHC couldn't take advantage of the federal investment tax credits. So PHC created a limited liability corporation, much like one that would be set up to finance affordable housing. St. Louis-based U.S. Bancorp Community Development Corp., along with the LLC, owns the panels and will receive the tax credits during the five-year period. During that time, PHC purchases the electricity from the LLC at commercial rates. After that, PHC will be able to purchase the array. "Ideally, we would like free power for the next 20 years after that-that's where the payback is," Murphy says. At today's electric rates, that would mean a savings of $75,000 per year. PHC also received $1 million from the Oregon Energy Trust. Of that, $150,000 is an actual grant and the remaining money was used to purchase green tags, known as renewable energy credits in some areas. About 300 kW came online this spring, and the remaining 570 kW is due to come online before year's end. And so far, the panels are operating better than estimations, Murray comments. When PHC first considered solar, Murphy says the solar generation system was expected to provide 125 percent of its current usage, meaning it produced more power than PHC required. But growth in the non-profit's manufacturing business has since meant that all of the electricity will now be used immediately.